Jenny Sala, a nurse of 40 years, is finally delving deep into a question she has had for decades. Through her work in the NURSE (Nurses Using Research to Support Excellence) Internship, she’s steering toward answers to improve patient care. Specifically, she’s using records of hundreds of patients who have been evaluated for pressure ulcers to determine risk factors for pressure ulcer development in critically ill adults. Her goal is to design an evidence-based pressure ulcer risk assessment instrument for these patients. As a wound care specialist for 18 years, Sala has dreamed of doing research dedicated to her patient population. She hopes to educate her fellow clinicians and drive prevention of hospital acquired pressure ulcers (HAPUs) through her risk assessment protocol. Sala is one of the first nurses accepted into the pilot Internship, which is paving the way for novice researchers at the University of Chicago Medicine. In light of nurses seeing the challenges faced by patients, but are often barred from conducting research that might present solutions due to a lack of time, The NURSE was designed to provide resources, mentors and training. Offered through the Center for Nursing Professional Practice and Research, the 18-month internship provides workshops on the design and conduct of research, as well as time and coaching for the interns to develop their studies. Participants, who commit 350 hours to the program, are collecting data, participating in data analysis and sharing their results. 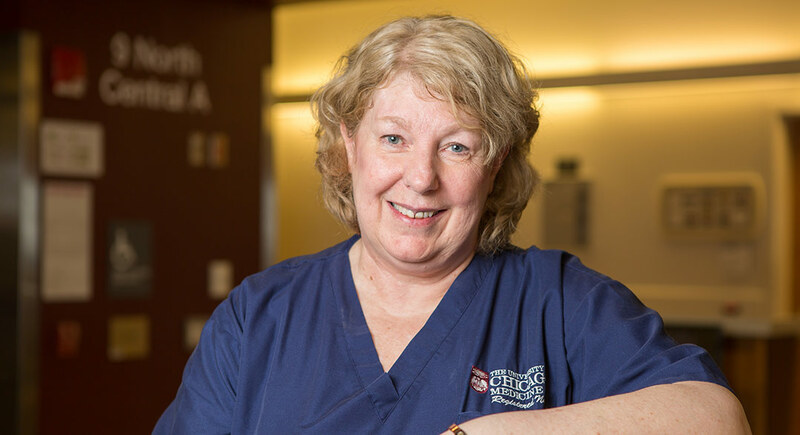 “The work of NURSE interns will contribute to the understanding of important problems in patient care and lead to new research questions to be investigated,” said Cynthia LaFond, PhD, RN, director for nursing research and principal investigator. LaFond, who has presented internationally on her research in pediatric pain, is guiding Sala and two others in The NURSE program. They are also supported by nurse scientist consultant Susan Vonderheid PhD, RN, as well as clinical experts at UChicago Medicine. The NURSE Internship program is supported by the Smart Family Foundation, Goldman Sachs and individual donors. The funding allows the nurses protected time to work on their reseearch, data and statistical support through the University of Chicago Center for Research Informatics, and to present their findings at a professional nursing conference. Along with Sala in medical intensive care, Susan Solmos, MSN, CWCN, manager, nursing clinical services, and Tess Cruz, RN, BSN, pediatric sedation are also using their protected time through The NURSE to conduct important research. Solmos has gained national recognition for her quality improvement efforts and education in skin care, which is also related to pressure ulcers. Cruz’s study is identifying the number of pediatric patients with hypotensive events, and their treatment, while undergoing sedated MRI. Through this research, nurses will gain a better understanding of fluid management in the sedated pediatric patient. The long-term goal is to develop an order set that will enable nurses to titrate both sedation and fluids based on the findings. In addition to decreasing hypotensive events, this could help reduce recovery times and create a more efficient workflow overall. “All nurses have questions. It’s empowering to be able to find the answers for yourself,” Cruz said. Donna Lemmenes, Pamela Valentine, Patricia Gwizdalski & Elinar Lowry (PI). Hospital Ethical Climate Survey. Cynthia LaFond, Monica Gonzalez, Ana Avila, Nicole Warczak, & Neethi Pinto (PI). Piloting a Picture of Pain in the Pediatric Intensive Care Unit (Multi-site study with University of Iowa, $1200 Mayday Foundation). Cynthia LaFond, Alyssa Kirk, Kelly Lankin, Caitlin MacKinnon, Susan Cohn (PI). The Experience of Children Undergoing 131I-Metaiodobenzylguanidine Therapy and the Parents and Nurses Who Care for Them: A Qualitative Descriptive Study ($4340 by the DAISY foundation). Mark Lockwood & Yolanda Becker (PI). A prospective cohort study to assess psychological factors that influence completion of the pre-renal transplant evaluation at an urban transplant center ($2500 by the International Transplant Nurses Society). Mark Lockwood & Yolanda Becker (PI). Determining Predictors of In-home Internet Access and the Use of Personal Health Record (PHR) Systems in an Urban End Stage Kidney Disease (ESKD)/Post-kidney Transplant Population in the United States. ($2500 International Transplant Nurses Society). Meghan Sweis & Elinar Lowry (PI). Combatting Role Ambiguity: Evaluating the Impact of a Clinical Nurse Leader Competency Visual Using the Clinical Nurse Leader Staff Satisfaction Instrument. Mary Tiberg & Andrew Arohnson (PI). The Diagnosis of Cirrhosis: A transition point in nursing care. Patti Ogden (PI). Tuberous Sclerosis Complex (TSC) Natural History Database Project. (Funded by the Tuberous Sclerosis Alliance). Jean Ridgeway. A pilot study, examining the use of an interdisciplinary educational checklist for allogeneic stem cell transplantation patients. Katheryne Amba & Tipu Puri (PI) Shift Handoff Communication Among Advanced Practice Nurses in an Acute Care Hospital. Catherine Murks & Nir Uriel (PI). Determining the Safety and Effectiveness of a Nurse Practitioner Led Clinic for Post Heart Transplant Patients. 23rd National Evidence-Based Practice Conference, University of Iowa Hospitals and Clinics, April 2016, Anabel Bedoya, Marla Robinson, Nancy Scott, Sarah Dangelo, Meghan Conroy, Canita Madison, Helen Mesina, Geline Vinne Goy, and Amy Krizmanic. Project Walk: An Interdisciplinary Early Mobilization Program for the Adult Medical Surgical Inpatients. 26th Annual Conference, Society of Pediatric Nurses, Minneapolis, April 2016, Monica Gonzalez and Denise LeNeave. Go With the Flow: Expanding Floor Nurses Skill Set to Care for Patients on High Flow Nasal Cannula Therapy. UHC Annual Conference, October 2015, Orlando, Emily Lowder, Joseph Giannini, Building an Inpatient Advanced Practice Nursing Service: Keys to Success and Sustainability . Association for Nursing Professional Development, July 2015, Las Vegas, Katherine Pakieser-Reed. Inspiring Innovation: Creating the PRN Clinical Nurse Educator Role. 2016 ANA Conference – Quality, Safety and Staffing, March 2016, Lake Buena Vista, Susan Solmos, Judy Doty. Taking the Pressure Off by Getting to the Bottom of the Problem: The Value of Expert Validation During Pressure Ulcer Prevalence Surveys. 26th International Nursing Research Congress, July 2015, San Juan, Puerto Rico, Mark Lockwood. There’s an app for that, is there an audience for that? Determinants of Smartphone ownership and comfort of use in an urban pre and post renal transplant population. Illinois Perinatal Quality Collaborative 3rd Annual Conference, November 2015, Chicago, Brandi Parker, Alissa Johnson, Sara Ham, Paul Suett, Phillippa Thompson, Patricia Kane, Takeshia Davis, Amy Schuch, Linda Lorenc, TiAnna Robinson and Joseph Hageman. Lean Hospital: Management for Daily Improvement in the Neonatal Intensive Care Unit. 35th American Society for PeriAnesthesia Nurses National Conference, April 2016, Philadelphia, Linda Schilawski, Beth Nardi. Breast Flap Education in the PACU. National Black Nurses Association, August 2015, Atlanta, Katheryne Amba. Current and Future Impact of Tele-ICU in Patient Centered Care. 23rd National Evidence-Based Practice Conference, University of Iowa Hospitals and Clinics, April 2016, Calvin Adatsi, Ihechi Alilionwu, Jessica Mazur, Megan Reape, Brenda Torres, Ronald Trinh. Prevention and Education of Violence in Nursing. AVA 2015 Annual Scientific Meeting, Association for Vascular Access, September 2015, Dallas, Janice Beschorner. Adhering to Timely Best Practice Protocols Decrease Central Line Associated Bloodstream Infections. 15th Annual Health Literacy Conference, May 2016, Anaheim, CA, Marina DePablo, Katherine Pakieser-Reed. Identifying Opportunities for Training on Health Literacy for Busy Staff. 2016 Annual Conference of Association of Clinical Nurse Specialists, March 2016, Philadelphia, Maryann Francisco. Sepsis Screening in an Adult General Medicine Unit. 23rd National Evidence-Based Practice Conference, University of Iowa Hospitals and Clinics, April 2016, Maryann Francisco. Sepsis Screening in An Adult General Medicine Unit. 41st Annual Conference, American Academy of Ambulatory Care Nursing, May 2016, Palm Springs, Ruth Mangonon-Barnes, Linda Jacobson. Developing an Ambulatory Orientation Program for a Hospital-Based Ambulatory Care Setting. UHC Annual Conference, October 2015, Orlando, Krystin Koscicki, Jenny Smazil, Kasie Stednitz, Kristine Valenzuela. Total Patient Care VS Team Nursing. Midwest Nursing Research Society Annual Research Conference, March 2016, Milwaukee, Cynthia LaFond, K Hanrahan, A. McCarthy. Practice Makes Practicable: Piloting Procedures for a National Point-Prevalence Study Regarding Critically Ill Children’s Pain. American Pain Society, May 2016, Austin. Cynthia LaFond, Kirsten Hanrahan, Ann Marie McCarthy. The prevalence of pain assessments, interventions, and painful procedures in critically ill children: a multi-site pilot. AORN Surgical Conference and Expo, April 2016, Anaheim, Rena P. Thompson, Mariana Boyle. Laser Training Achieving Safety and Education through internal Resources. AORN Surgical Conference and Expo, April 2016, Anaheim, Rena P. Thompson, Mariana Boyle, Linda Minella. Pressure Ulcers: Preventative Measure Through the Perioperative Spectrum. AORN Surgical Conference and Expo, April 2016, Anaheim, Rena P. Thompson, Mariana Boyle, Linda Minella. The Trouble with Restraints: Dismantling the Myths of Use in the OR. Pediatric Nursing Conference, June 2016, Philadelphia, Denise LeNeave. Wrap Your Brain Around It: Developing Clinical Expertise in Pediatric Neuroscience Nursing. UHC Annual Conference, October 2015, Orlando, Emily Lowder, Iliana Staneva, Gretchen Pacholek, Corrin Steinhauer. Reengineering the Discharge Process to Enhance Organizational Throughput Using Lean Methodology. DDW 2016, May 2016, San Diego, Nayna Lodhia, David Rubin, Konstantin Umanskiy, Janice Colwell, et al. Use of Diverting Ileostomy as an Induction Strategy for Severe Perianal Crohn’s Disease. 2015 Pediatric Nursing Conference, July 2015, Chicago, Georgia Orchowski. PICU Training Wheels: Bedside Education to Improve Nursing care in the Pediatric Intensive Care Unit Pediatric Nursing . American Academy of Ambulatory Care Nursing, May 2016, Palm Springs, CA, Linda Jacobson, Ruth Mangonon-Barnes. Developing an Ongoing Competency Assessment Program in a Multi-Specialty, Hospital-Based Ambulatory Care Setting. American Pain Society’s 35th Annual Scientific Meeting, May 2016, Austin, Cyntha LaFond, K. Hanrahan, A. McCarthy. The Prevelance of Pain Assessments, Interventions and Painful Procedures in Critically Ill Children: a Multi-site Pilot. 4th Annual Lown Institute Conference, Research Day, April 2016, Chicago, Nimit Desai, Ambrosio Tuvilleja Jacqueline Ramos, Dawn Kohl, Mary Ann Francisco, William Marsack, Cynthia LaFond, Samantha Anderson, Mila Grossman, Jay Balachandran, Babak Mokhlesi, Jeanne Farnan, Vineet Arora. Using “Electronic Nudges” to Reduce Unnecessary Overnight Medical Care Disruptions in Hospitalized Patients. Cynthia LaFond, Vincent, C. V., Corte, C., Hershberger, P.E., Johnson, A., Park, C. G., & Wilkie, D. J. (July 2015). PICU Nurses’ Pain Assessments and Intervention Choices for Virtual Human and Written Vignettes. Journal of Pediatric Nursing, 30( 4), 580-90. Michele Rubin, (2015). Inflammatory Bowel Disease: Surgical Management. Ostomy Management WOCN Society Core Curriculum, Wolters Kluwer, Chapter 4, part 2, 44-64. Michele Rohrman, (November 2015). Macacine Herpes Virus (B Virus). Workplace Health and Safety, 64(1), 9 – 12. Prinz, A, Janice Colwell, Cross, H, et al. (2015). Planning for a Patient With a New Ostomy: Best Practice for Clinicians. Journal of Wound, Ostomy, and Continence Nursing, 42 (1), 79–82. Janice Colwell, Stoma Complications in the Patient with Inflammatory Bowel Disease, chapter, Inflammatory Bowel Disease. Janice Colwell, (2016). Enterostomal Therapy Stoma Management in the Management of Crohn’s Disease, chapter, Crohn’s Disease: Basic Principles, Springer. Julie Colwell, Skin Integrity and Wound Care, chapter, Fundamentals of Nursing, 9th Ed. Mark Lockwood, (September, 2015). “Determining Barriers to In-home Internet Use and the Use of Personal Health Record (PHR) Systems in an Urban Pre- and Post-kidney Transplant Population in the United States.” 2015 International Transplant Nurses Society Research Grant Award, $2,500. Julie Lester, Debra Nawracaj, (2015). “’EMPower Grant’ Focusing on Maternity Practices Leading to Baby-Friendly Designation.” Centers for Disease Control and Prevention’s (CDC) Division of Nutrition, Physical Activity, and Obesity (DNPAO) in partnership with the Carolina Global Breastfeeding Institute (CGBI) and the Center for Public Health Quality (CPHQ). QI Empowerment Grant $10,000. Katherine Pakieser-Reed, Brenda Battle, (April 2016) “Discover Nursing!” $7,725.00. Nurses continuously evaluate their practice through the use of clinical inquiry and assessment of patient outcomes. 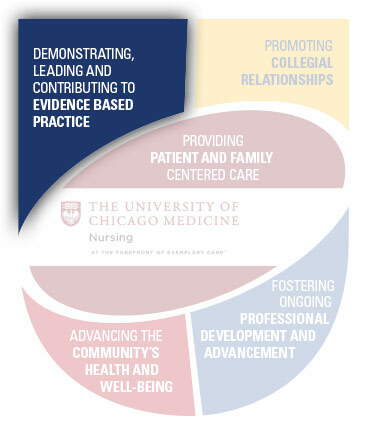 Translation of research and incorporation of evidence-based practices in our care leads to optimal outcomes for our patients. Nursing research and evidence-based practice projects add to the depth and breadth of nursing knowledge.